Lexington, KY – With the second day of dressage completed at the Rolex Kentucky Three-Day Event presented by Land Rover, William Fox-Pitt (GBR) now sits in the lead with Chilli Morning after earning an impressive 33.3. Fox-Pitt had a practically flawless dressage test with Christopher and Lisa Stone’s 13-year-old stallion in front of the Ground Jury of Nick Burton (GBR), Christina Klingspor (SWE), and Brian Ross (USA). Andrew Nicholson (NZL) and Quimbo are a close second after earning a score of 38.0. Deborah Sellar’s 10-year-old Spanish Sport Horse gelding performed a lovely test for Nicholson. Quimbo performed well under the pressure of the Rolex Stadium in his first CCI4*. “I think he pretty much gave 100 percent. He is only 10 years old and with these four-star tests, I think they have to be physically strong to maintain the necessary collection and fluency of the movements,” said Nicholson of his young mount’s notable score. Nicholson lost his Thursday lead with Calico Joe but still sits in third with a score of 40.8 with Twenty Twelve in Mind’s 11-year-old English Thoroughbred gelding. Twenty-six year-old Allie Knowles (Paris, KY) had a stellar performance in her first CCI4* appearance with her and Christie Campbell’s Last Call. 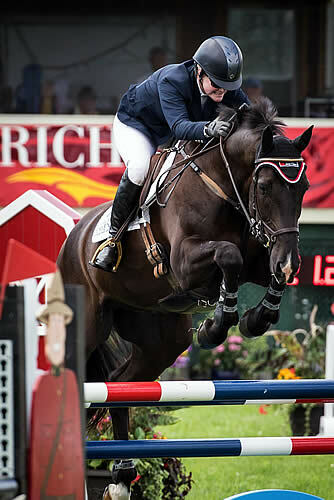 She currently sits in fourth place with a score of 43.3 after riding a beautiful, rhythmical test on the 14-year-old Mecklenburg mare, holding her own with the best in the world. Being the highest-placed American after dressage, Knowles leads the Rolex/USEF National CCI4* Eventing Championship. She was very pleased with her test, in which the only noticeable mistake was in her last flying change. The pair won the Galway Downs CIC3* in 2011 and finished in sixth place in an Advanced division at The Fork Horse Trials this year. Marilyn Little (Frederick, MD) is the second highest-placed American, tied with Mary King in fifth place after scoring a 43.7 with RF Demeter. Little performed a smooth, flowing test with Raylyn Farms and Team Demeter’s 11-year-old Oldenburg mare. The pair finished ninth here in Kentucky last year and placed fourth in The Fork CIC3*earlier this spring. Riders will now tackle the solid CCI4* cross country course designed by Derek di Grazia. The course covers 6500 meters and has 28 numbered fences. Cross country begins Saturday at 10:00am ET with William Fox-Pitt and Seacookie TSF. Watch the live stream on the USEF Network presented by SmartPak. In addition to the broadcast, the order of go, results, and photos can be found here: http://www.usefnetwork.com/featured/Rolex3Day2013/. Follow the 2013 Land Rover U.S. Eventing Team at http://usefnetwork.com/featured/2013Eventing.